Join the 2013 Harmony Walk! Welcome to the September issue of The Voice of Volunteering. Nominate online, download and print a copy of the form or phone 02 9261 3600 for a hard copy. Don't forget you can now complete your nomination in multiple sittings online. The regional judging process was completed on Wednesday 18 September and invitations are now on their way to nominators and nominees for the regional ceremonies which will be held from October 10. We'd like to thank the judges of the Awards for their time and effort in assessing each and every nomination. The winners of the regional awards will be invited to Sydney for the state awards in December. Welcome to all our new and renewing members for the 2013-2014 membership period. We look forward to working closely together with you to harness the power of volunteering in your organisations. If you are yet to renew your membership or would like to discuss membership further, please email Membership Services at membership@volunteering.com.au with your query. Why does The Centre for Volunteering require our members to provide us with up to date insurance details? As our member organisations know, one of the conditions for the use of our Volunteer Referral Service, is that we require confirmation, in writing, of current Volunteer Accident Insurance and Public Liability Insurance. Insurance protects everyone. They protect organisations against any claims from volunteers for injuries suffered at work and they protect volunteers from these same injuries in case of accidents in the workplace. No doubt our member organisations will all agree that these insurances are the basis of providing a safe and fair environment for both staff and volunteers and provide everyone with a level of security and protection should something unexpected occur. Thank you for providing this information to us on a timely basis so that we can continue to reassure all those volunteers we refer to you that they are fully protected. The Centre, in conjunction with Youth Action is holding an event at 2pm, 9 October 2013 on Engaging Youth volunteers. Eamon Waterford is the Director of Policy & Advocacy at Youth Action. He will focus on how to recruit young people to your volunteering program, what young people want out of volunteering, and how to ensure you as an organisation get value out of young people. He will also be presenting on his experiences running an internship program for young people through Youth Action. Our September Networking event: How to get a Corporate Partner: A Toolkit was well attended. Video from this session is now available on our YouTube channel for viewing. If you have a suggestion for a topic please don't hesitate to get in touch with us. Insert Page numbers into documents? Add a Title to your Cover Page? Create a Table of Contents? Add Section Break or Columns? Move text from one styled area to another and apply new formatting while pasting? Do you know how to create a form document with merge fields? Can you create a table, insert cells and columns or add an external table? Are you able to discern when it is better to use a Spreadsheet? Edit text in a multiple cells? Change colours of a cell? Change the type of data is stored in a cell? Use calculations and simple formulas? Use logic formulas and IF statements? Share information across data sheets? The Centre for Volunteering would like thank the organisations involved in our school and university based Introduction to Volunteering seminars. These seminars, organised by The Centre are a great way to get young people engaged with and thinking about volunteering. On Friday, the 20th of September, we held an Intro to Volunteering seminar at Roseville College in Sydney’s North. The seminar created a great opportunity for students to be informed about youth volunteering and be inspired to be involved. Students were also able to gain a great insight into the work of various not-for-profits within their community. Preliminary feedback shows that most of the Year 10 students felt as though they learnt a lot from the seminar and found the information presented useful. They also enjoyed the variety of organisations involved on the day, including ARV, Community Connect Gardening and Cerebral Palsy Alliance. Student volunteering is on the rise. The Intro to Volunteering seminar offers a great opportunity for organisations to connect with young people and to show young people the variety of volunteering opportunities available. In particular, we can raise young people’s awareness about the community and the immediate and ongoing positive impact they can have through volunteering, whilst providing them with the tools necessary to take social action. For the not-for-profit sector, this provides a great way to increase our workplace and create a diverse workforce. Intro to Volunteering seminars are a great way to encourage community involvement and can tie in well with community involvement programs run in NSW high schools. The Dragon Charity walk is held each year. This year the aim is to raise funds for the construction of the Chinese Australian Services Society's residential aged care facility in Campsie. 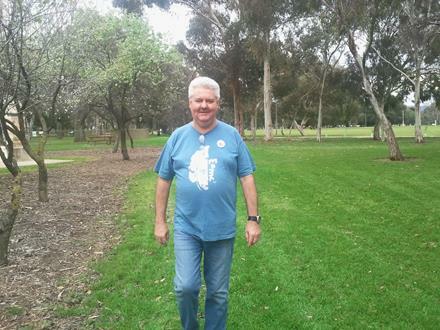 The Centre's General Manager & Research Development and Policy Manager, Tony Frew will be undertaking the walk this year on 29 September. The outspoken CEO of the UK’s Directory of Social Change has urged the Australian Not for Profit sector to avoid the mistakes of charities in the UK at the National Conference on Volunteering in Adelaide. Debra Allcock Tyler, described by conference MC Amanda Blair as ‘a Duracell bunny with a potty mouth,’ held the crowd spellbound during her keynote address as she passionately encouraged charities to stand up for themselves and avoid compromising their mission to serve others for the sake of money. The Volunteer Expo held in 2012 was a huge success, with over 55 community organisations from the St George and Sutherland Shire areas taking the opportunity to promote their organisation to more than 400 potential volunteers who attended on the day. Almost all of the stallholders said that they would gain between 2 and 25 new volunteers through their exposure at the Expo, and 90% of them expressed interest in participating again. Harmony Walk brings together Australians from diverse national, ethnic and religious backgrounds to help build an inclusive society, and to acknowledge and celebrate the enduring principles of fairness, harmony and respect. The walk is FREE and is suitable for people of all ages and abilities. At the conclusion of the walk, participants will enjoy a multicultural food stall, entertainment, and a number of activities designed to promote inclusion and harmony. Five charities. Five developer teams. Five apps to change our world. Vodafone Foundation’s App Aid 2013 will help up to five charities see their organisation through fresh eyes and find new and innovative ways to assist the communities they serve. To help them, we’re pairing these courageous charities with some of Australia’s most talented digital agencies and developers. 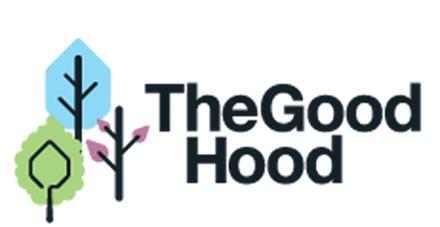 The Good Hood is an initiative by the City of Sydney's Green Villages program to highlight the "good" things in the city. AAMoV is committed to promoting and celebrating best practice in the field of volunteer management and annually recognises a manager of volunteers for his or her outstanding contribution to the profession. Nominations opened for the Volunteer Manager Award of Excellence on 1 September each year. Every year across Australian and New Zealand millions of volunteers, involved across all sectors of society, give their time so freely sharing their time, energy and passion to make a very real difference in their communities. As is often the case the role of those who manage or coordinate the volunteers sits behind the scenes, largely unrecognised. The AAMoV Volunteer Manager Award of Excellence is a tremendous opportunity to recognise these people. No matter whether the volunteer manager has been on the front line putting their lives at risk for the sake of their community or working in the community for sporting groups, the arts, local government, hospitals, environmental or community welfare organisations and the like, these people are ensuring the true value of volunteer contributions are felt. Think about those managers of volunteers that you know who do an outstanding job to inspire, encourage and lead volunteers to be the best that they can be and to make a real difference in their communities and nominate them for these awards. Nominees do not need to be members of AAMoV. Applications open 1 September and close 30 September with the winner announced on International Volunteer Managers Day, November 5 each year. So get your nominations in and let’s publicly recognise and celebrate the fantastic job these managers of volunteers do! 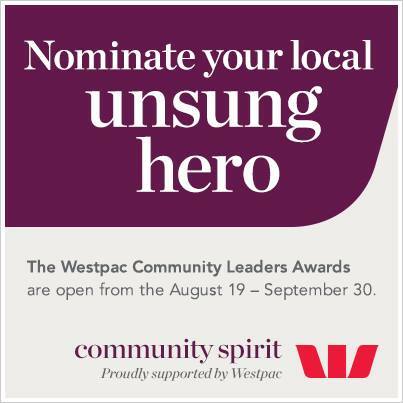 The Westpac Community Leaders Awards are an opportunity for you to give your local hero a chance to be really recognised. The awards are dedicated to inspirational leaders who make a significant contribution to our social fabric through their service to Not for Profit organisations in Australia. Nominate a leader in your community today and their organisation could win an award of $5,000 and $5,000 worth of Westpac Davidson Institute financial education training. The winning leaders themselves will also receive a Westpac MasterCard® Gift card to the value of $500 as a personal reward. Nominations are open from 19 August 2013 and close on 30 September 2013. Winners will be notified by 1 November 2013.